Moulds (or molds) are single-celled fungi that appear multi-cellular because they grow in filament-like segments called hyphae. They are a taxonomically diverse group, thousands of species are known, but many more remain unknown. Within the fungal group, it is estimated that only about 7-8% of all species have been taxonomically described. Moulds are fairly benign, some are beneficial and are used in fermentation and other applications, while others still are mildly to extremely pathogenic. Pathogenic effect may be as simple as a mild to serious allergic type reaction to spores or fungal growth inside or outside the body, or as extreme as muscle wasting, neurological damage, or even death from the effects of mycotoxins. There is no 100% reliable way of telling which mould is which is which with the naked eye. Mycotoxins vary, but some of them are amongst the most toxic substances on earth, widely considered to be more detrimental to health than heavy metals or pesticides. They should be considered as a defence mechanism, by which the mould protects itself from bacteria, viruses, and higher life forms. Attacking a mould ineffectually increases the output of mycotoxins, and we will get back to that very important point later. Another point we will get back to then is the fact that yeasts are also single-celled fungi that may exhibit the form of pseudo-hyphae (mimicking the habit of moulds) by conjoining, and like moulds, many can and do produce mycotoxins when threatened. Many of the symptoms of a Candida albicans overgrowth, for example, may be attributed to the production of mycotoxins. So given that many moulds are toxic, even potentially deadly, and that there is no way of telling one mould from another with the human eye, and then considering that moulds mutate with such ease and rapidity, so that even lay-person identification with a microscope is no guarantee of safety, we might like to know under what circumstances is mould safe in a food context. It stands to reason that mycotoxins will not harm us until we ingest or inhale them, so we want to avoid doing that as far as possible. 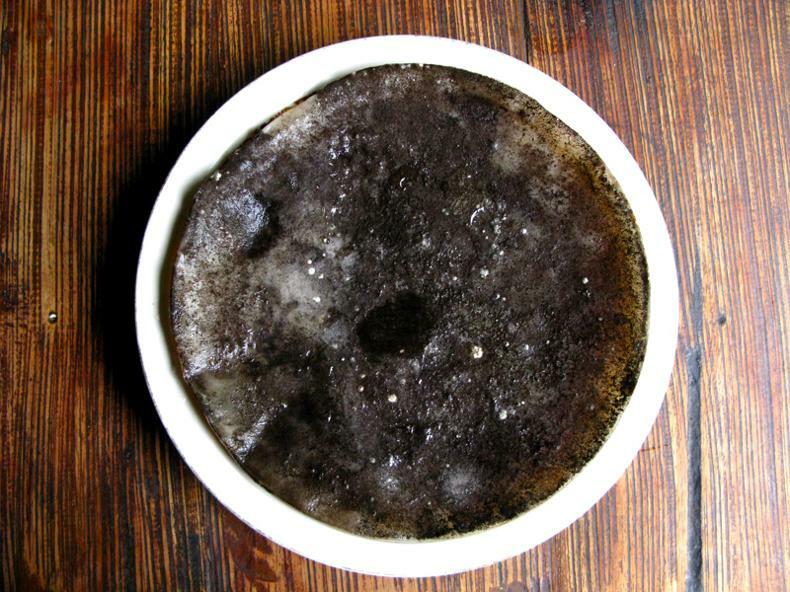 Which brings us to the question of mould and fermented foods. At what level, or in what state, is mould safe to remove? Is the advice we receive about mould correct, or should we exercise more caution? Now, this isn’t to say the people who give this advice are callous or ignorant or cavalier – they are intelligent, well-meaning people, repeating what they have heard or read or assumed based on received wisdom. As we shall see later, the danger with received wisdom is that is often formulated under conditions very different to those we know now. So, we may well ask has mould in foods and mycotoxin distribution been investigated scientifically. The answer to that is: yes it has. Both the CSIRO in Australia, and the USDA in the United States have determined through analysis that once mould is visible to the naked eye, the hyphae have already penetrated well below the surface. Mycotoxins are predominately produced by the spreading tip of the hyphae to negate competition from other organisms. This means that in a soft or liquid medium, the hyphae, spores and mycotoxins are fairly well distributed. In a brine based ferment (including self-brining ferments like sauerkraut), this means that mycotoxins will be present throughout the entire fermenting vessel. There are no exceptions to this fact. If there is mould on the surface of your ferment, it is all the way through it. The choice is then yours – keep it, it chuck it. You may decide that the chances of one of the highly toxic moulds having colonised your ferment are fairly slim, and this may in fact be the case, but even the moulds which produce relatively mild mycotoxins can become a real hazard to health under certain conditions. One of those conditions is EM pollution. So, unless you live somewhere remote, where you have no power, and are outside of mobile phone range, then you might like to think twice before giving that ferment to yourself or your children because it was just a little bit of mould, and you got it very quickly. 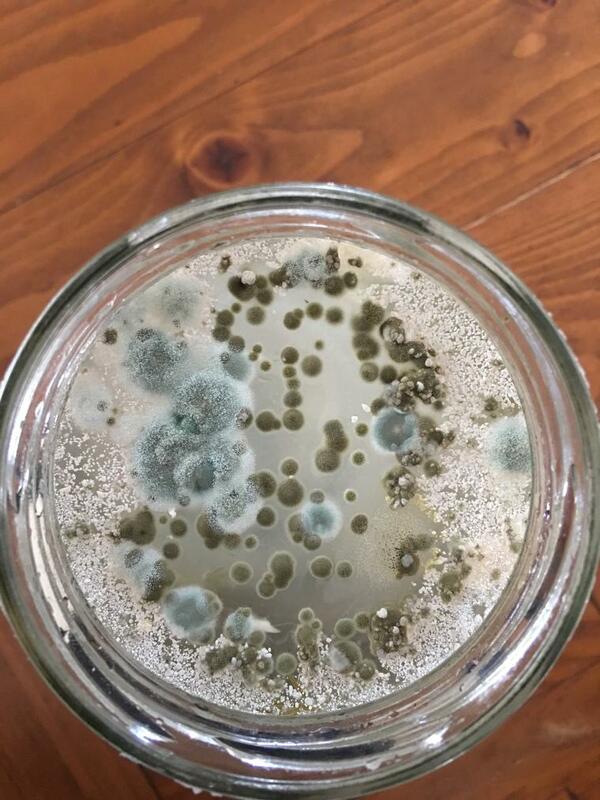 It is not my role or place to tell anyone what to do with their ferments if they become mouldy, I merely hope that the information contained here helps each individual make up their own mind about whether to keep or toss that mould ferment. If Celestial Roots free information and advice has helped you, please consider a donation. Thank you.